And now for what has to be the most popular theorem in all of homological algebra: the snake lemma. This shows up in every first course in algebraic topology, and always with the same diagram-chasing proof (though not with the same semantic sugar as we’re using). And some grad student always raises the same objection halfway through (I did it in my class). And the follow-up is always the same. Weibel’s An Introduction to Homological Algebra points out that the proof is best seen visually, but I don’t have a video camera like The Catsters. Weibel also points out that a good visual presentation appears in the 1980 movie It’s My Turn. I looked around everywhere but couldn’t find a clip online. So, if you have access to the movie it’s old enough that I’m sure the producers wouldn’t mind a teensy clip posted for The Good of Mathematics. Call it “fair use”. [UPDATE]: Down in the comments, Graham points out that someone at Harvard has posted the clip here. Tough to see, though. We start with two short exact sequences and a morphism from one to the other. 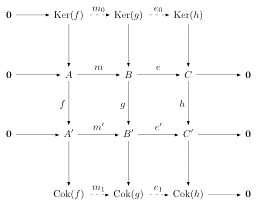 We construct the kernel and cokernel of each arrow, and then use their universal properties to construct arrows between the kernels and cokernels. It is straightforward to show that the given rows are exact — in particular, is monic and is epic. We start with the same middle rows as before and construct and . Now we use one of our lemmas (and its dual) to construct the pullback , the pushout , and the two dashed arrows. Notice that here we’re using the (unshown) facts that is monic and is epic. We have an arrow , which satisfies and . And then since is the kernel of and is the cokernel of , we see that factors as for some unique . What does this arrow do to a member ? Well first it gets sent to . Then because is epic there must be a with . We calculate that . But then by exactness there must be with . 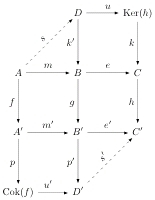 This is the usual diagram chase given to construct the connecting morphism. Now I claim that . Since is monic we have , as desired. This also shows that the equivalence class of is independent of the choices made in the construction of the last paragraph, which is the standard objection I mentioned earlier, now handled in a very slick (but not diagram-chasing) way. So now we need to verify the exactness of the long sequence. We’ll show the exactness at , and that at will follow by duality. First of all we need to see that . For this, we show that for any . Now when we use the diagram chase our first step is to choose a with , where is the kernel map. This shows we can choose . But then , and so we choose and find . Now take with , meaning that we construct . By the definition of the cokernel there will be with , so . The “subtraction” rule gives us a with and . But now by the definition of we have with . Then , and so because is monic. And thus the sequence is exact at . Incidentally, what the setup of the snake lemma tells us is that the category , while always enriched over , is not generally abelian itself. If it were an abelian category the upper and lower rows of the first diagram would have to be short exact sequences themselves. That doesn’t quite happen, but we can exactly capture the obstruction to existence of kernels and cokernels in a single connecting morphism. If this morphism is the zero morphism, then we can insert into the long exact sequence and then break it into the two short exact sequences, and thus we have a kernel and a cokernel for the triple . Notice here that , so the obstruction lives in this abelian group, which is determined by and . Thus in a sense a morphism of short exact sequences has or fails to have a kernel and a cokernel on alone. I’ll leave this to you to ponder: if we’ve given and , must there exist a so that has a kernel and a cokernel — so that ? And if so, how can we find it? I might be missing something here, but your isn’t an arrow…you can’t do that composition with the diagram as written. There. should be the vertical arrow straight down the middle of the second diagram. Mathematics in Movies, sixth clip. You lost me in the middle. Why is u the cokernel of s? HC: I’m composing this on the fly while I wait for my plane, so I’m hoping I don’t make a mistake here. If I recall correctly, that’s something that follows from the lemma about pullbacks we proved earlier. It should be in one of the posts linked at the top of this post. If I’m wrong, point out where you lose it and I’ll give it another look when I’m back at a real computer instead of my iPhone. HC: I think that follows from the axioms of abelian categories: every epic is cokernel of its kernel. Since e is epic, so is u with kernel s by the lemma. Then u is cokernel of its kernel s.